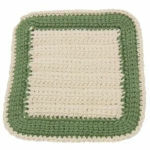 Julies Shoo-Fly Cover -- A free Crochet pattern from Julie A Bolduc. This piece is designed to keep flies and bugs out of your drinks when you are out side. It is made to cover a glass or dish up to 6½" in diameter. The weight of the beads should be enough to keep it on the dish or glass. Someone requested a pattern for a shoo-fly cover and this is what I came up with.